The old churches of Rome are wonderful guides to its Christian past. As a student almost 50 years ago I went through them with books like Hertling and Kirschbaum’s The Roman Catacombs and Their Martrys, a book I still keep at hand along with newer ones. The 5th century church of Saint Peter in Chains is a church I’ve always associated with the First Marytrs of the Church of Rome, a feast we celebrate today, right after the feast of the apostles, Peter and Paul. It was built near the Roman Prefecture, where people were dragged in chains to be interrogated, tortured, and made to face Roman justice. The Romans were sticklers for procedure. You had to be tried in court. Many Christians–we are not sure how many–were brought to justice near this church. Those chains above may actually come from the nearby Roman jail. I wrote about it here , and I have a video you can see here. This entry was posted in Religion and tagged Christian, martyrs, Nero, Passionists, persecution, Rome, Saint Peter In Chains on June 30, 2009 by vhoagland. News reports today on the tomb of Paul at Saint Paul Outside the Walls say the bones come from someone from the first or second century, buried with honors. We were in the basilica last November where greater access has been provided to go down beneath the main altar and reverence the tomb. On the Vatican site, you can now take a visual tour of the necropolis underneath St. Peter’s Basilica and see the tomb of Peter. It’s a favorite tour for pilgrims, but because of space visitors are limited. This visual tour is a great alternative. 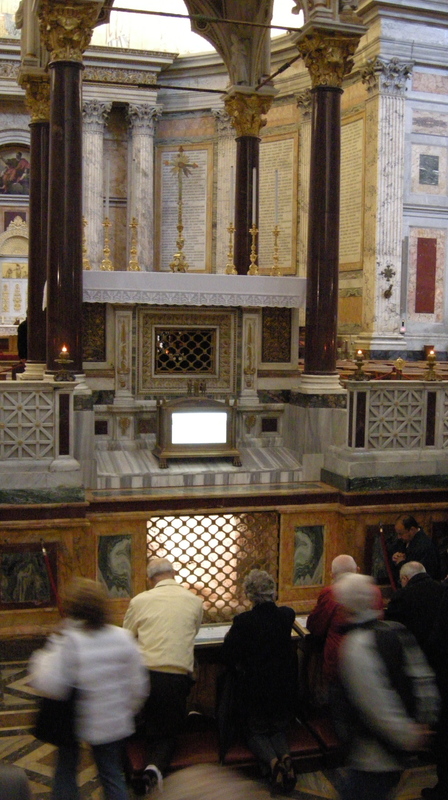 This entry was posted in Religion and tagged Feast of Peter and Paul, Passionists, tomb of Paul, tomb of Peter, Vatican necropolis on June 30, 2009 by vhoagland. We’re celebrating Mass, which is time to thank God for the blessings we’ve received. You know priests are told they shouldn’t talk about themselves in the homily; they should talk about the scriptural readings for the day. But I know you wont mind if my homily takes a personal turn today as I celebrate with you 50 years as a priest. I was ordained on the feast of St Juliana Falconieri, June 19, 1959, in St. Michael’s Monastery, Union City, NJ. The bishop ordaining us was Bishop Cuthbert O’Gara, a Passionist bishop who had just been released from a Communist jail in China. 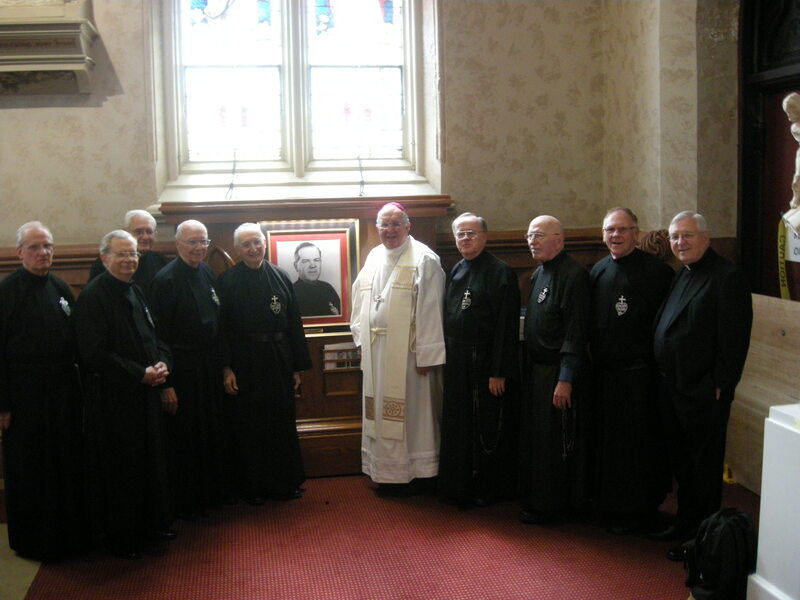 June 19th was a late date for our community to ordain priests. Usually ordinations were in February, or April. June 19 was a very late date. We didn’t have any particular devotion to St. Juliana Falconieri. Probably, those in charge didn’t want to unlease us on to the world without getting as much as they could into our heads. There’s not much to tell you about how my vocation to the priesthood came about. I knew a good number of priests and liked them. I liked the Passionists who helped out in our parish in Bayonne and I joined the community in 1950 out of high school, and they took me in. 1950 was also when the Korean War began. China was deeply involved in that war. Our community had priests in China then as missionaries, who worked with the Sisters of Charity from Convent Station, and they were imprisoned, humiliated and finally thrown out of the country by the Communist government after war broke out. They went through awful sufferings. One of them, Bishop Cuthbert O’Gara, bishop of Yuanling in China, ordained me. As a young student and a young priest I was fortunate to live with many of those men when they came home. They were men of great faith, inspiring, dedicated, zealous– heroes in my mind. Many of them after a little while went to our new missions in the Philippine Islands and Jamaica. They left their mark on me. Now remember, this was in the 1950’s, the Cold War was on. We were fighting Communists then, not trying to understand them. Yet he told us to learn as much as we could about the world we were living in. He wanted us to learn Chinese, to read the religious texts of Buddhism and Hinduism. “Asia is going to become more powerful, learn about it.” He was right, 50 years ago. Because of priests like him, I’ve never felt my life as a priest has been limited. The faith we have in Jesus Christ is not just a package of tightly bound beliefs that you memorize; faith is a way of taking in the world as Jesus takes it in. At Mass, the priest represents the world as it is, in all of its variety and completeness, as Jesus does. Our faith is not meant to make us small-minded. My community sent me to Rome to study theology in the 1960’s, an interesting time to be there, because the 2nd Vatican Council was taking place. I studied with a great Jesuit theologian, Bernard Lonergan. He wasn’t a good teacher, his classes were disorganized, but he was brilliant. One thing he said I still remember. “We go to God through questions. You may answer one question, but that opens twenty more, and so it goes. On the last day of class he said, “ Well, I got this far. If I get any further, and you come back next year, I’ll tell you where I am. But for now, I got this far.” So, at the end of his course, you didn’t know it all. You knew there was always more to come. God is there from the beginning, God will be there in the end, God is with us now, but we inch along. Over the years, my teachers haven’t been just university professors or priests. I’m grateful for those basic schools where we learn so much, for my family into which I was born, for the friends I grew up with. I’m grateful for my years here at St. Mary’s. The priests, sisters and people of this community have taught me a lot about life and faith and God who is present among us. I thank God for all of you. I was ordained less than five months after Pope John XXIII announced the opening of the Second Vatican Council, and as a priest I’ve seen a changing church and a changing world. I lived through the social revolutions of the 1960’s and 70’ and 80’s. I’ve experienced the liturgical movement, the ecumenical movement, the charismatic movement, the feminist movement, the environmental movement. It’s been a world of change. Certainly we all have questions about our troubled world and our troubled church. I wonder, for example, will there be priests to come after me? What about the next generation and the next? Will they go to church? Someone described our times as a revolution that nobody understands. I don’t understand it, but I have an assurance that faith gives that “ all will be well” as we inch along. We have questions, but we go to God through them. “Let us give thanks to the Lord, our God.” We’ve got this far. This entry was posted in Religion and tagged 50 years ordained, Catholic, Passionists, priest, St. Mary's Colts Neck on June 30, 2009 by vhoagland. A memorial area honoring Fr. Theodore Foley, CP in Sacred Heart Church, Springfield, Mass. was blessed today by Bishop Timothy A. McDonnell of the Diocese of Springfield. Fr. Theodore led the worldwide religious community of Passionists until his death in 1974 and the process for declaring him a saint has begun in Rome. Sacred Heart, in Springfield’s North End was Foley’s parish where he was baptized, attended school and served as an altar boy. I was one of nine Passionists at the service, along with a number of diocesan priests, seminarians, sisters and laity. I liked Bishop Mc Donnell’s observation that Fr. Theodore is “a reminder that holiness is all around us.” How true that is! The memorial area in this beautiful church built in 1889, which has been the spiritual home for so many from the area, is a testimony to the simple, powerful faith of generations of loyal Catholics like the Foleys and their holy son. The Springfield Republican covered the story http://www.masslive.com/news/index.ssf/2009/06/late_springfield_priest_rev_th.html?category=Springfield and CBS televevision. This entry was posted in Passionists, Religion and tagged Catholic, memorial space, Passionists, Sacred Heart, saint, Springfield, Theodore Foley on June 24, 2009 by vhoagland. The Passionists, the community I belong to, were founded by St. Paul of the Cross (+1874) to keep alive the memory of the Passion of Jesus Christ. For 86 years, from 1915-2001, people from Saints Joseph and Michael’s parish in Union City, NJ, a parish nearby where the Passionists served for many years, presented a Passion play, “Veronica’s Veil,” during Lent. Two Passionists , Father Bernardine Dusch, CP, and Father Conrad Eiben, CP, were the play’s creators. Patrick Allen, a Union City native and the last stage manager of the play in 2001, has begun to bring the play “back into service,” he says. Last Lent, on Good Friday, the Veronica Veil players processed through the streets of New York’s Little Italy near Old St. Patrick’s Cathedral, reenacting the Lord’s journey to Calvary, and ended up in the church itself. Patrick hopes to present the play again in Union City and New York City this coming Lent. This Thursday, June 25th, he’s accompanying Archbishop Timothy Dolan, the new archbishop of New York, to Rome where the archbishop will receive the pallium from Pope Benedict XIV. 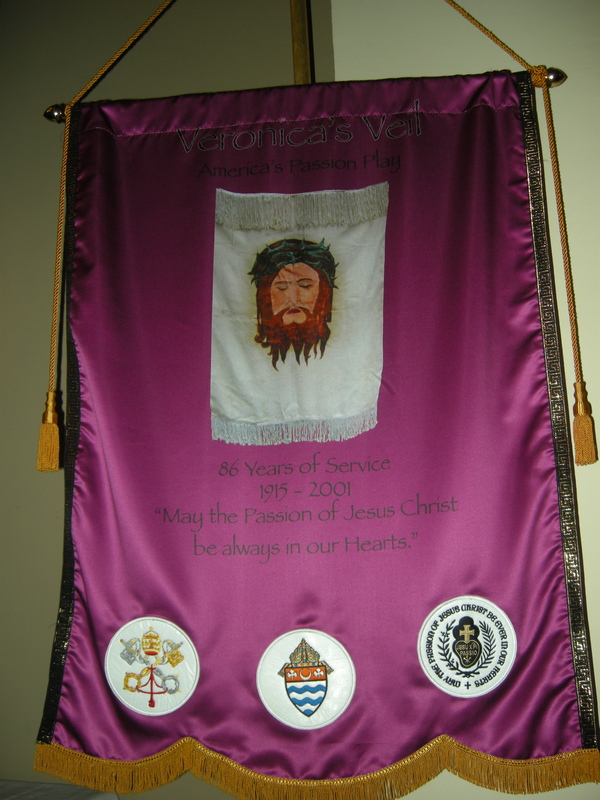 At the Mass, Allen will bring a service banner from Veronica’s Veil as part of the offertory gifts. 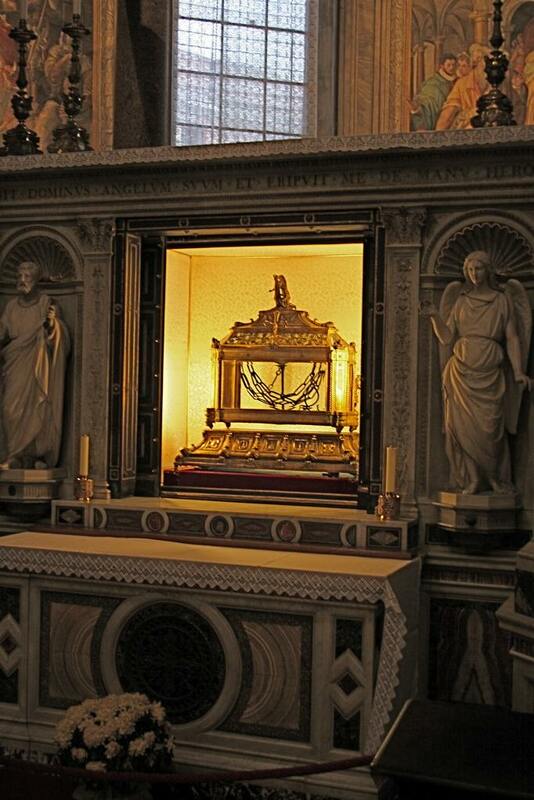 Afterwards, the banner will be placed with the original relic of the veil presently enclosed in one of the great pillars in St. Peter’s Basilica next to the main altar. Here’s Patrick talking about Veronica’s Veil. This entry was posted in Passionists, Religion and tagged Archbishop Dolan, Passion of Christ, Passion Play, Passionists, Rome, Veronica's Veil on June 22, 2009 by vhoagland. The Iranian revolution is a fascinating event. It’s opened new ground in communications, for example. The commentators on CNN last night said that the government can hardly control the information available through cell phones, Facebook, Twitter. They‘ve blocked the regular channels, like television and radio, and the journalists who work for them, but a wealth of information comes from ordinary people on the streets. The 18th century founder of my community, St. Paul of the Cross, was a prolific letter writer. Letter-writing was the rage then, the most popular new form of communication of the time, and he used it to reach a wide range of people. I think he would blog today. I wish, too, that his community would take more of an interest in the new media. It’s a way to speak to the world. This entry was posted in Religion and tagged cell phones, CNN, Current events, Facebook, Iranian revolution, new media, Passionists, Twitter on June 22, 2009 by vhoagland. This entry was posted in Religion and tagged faith, old age, Passionists, storms, T.S.Eliot on June 21, 2009 by vhoagland.